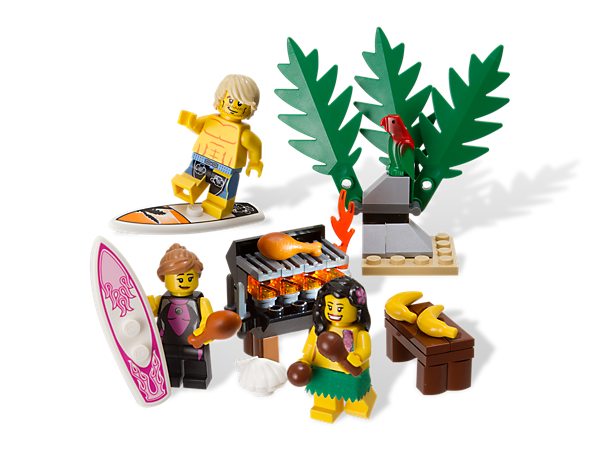 There is a new store set hitting the shelves called 850449: CMF Beach Set. 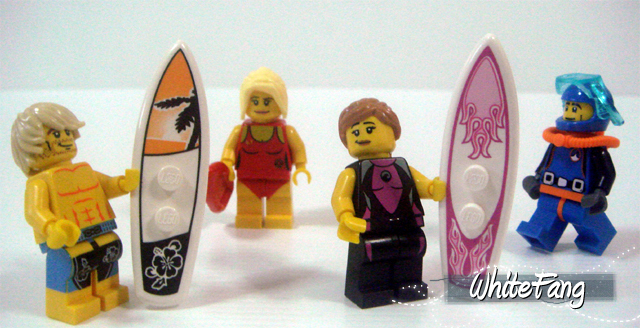 The set comes with 63 pieces and includes 3 CMF minifigures, the male surfer from series 2, the female surfer from series 4 and the hula dancer from series 3. The set will be prices at £9.99 in the UK and $15 in the US. 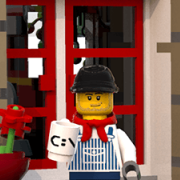 Image from Jenni on Brickset forum. Edit by Rufus: Thanks Dane for the Shop@Home Link. I think that this is actually a pretty cool set. I know that quite a few AFOLs will complain that it isn't a zombie or Spartan set, but there is always later. Is this set store exclusive, or will it be everywhere? With the set code I think it is safe to assume it is store/shop@home only. Looks nice indeed! I have one question, though. With these, now we have two re-releases of CMFs (the other being the calendar). And I think that when Lego was about to launch CMFs, they said that the figs were exclusives to the theme and wouldn't be released in other sets. Do I remember correctly? Because if I do, then they clearly haven't stuck to that (not that I'm complaining; I'm just curious). All in all, great set! Shame it's missing the lifeguard (and possibly the diver and swimmer, but the lifeguard stands out). I wonder why TLG decided to release it, and whether there will be more sets like this. Thanks for sharing, that is a really cool little set, it does remind me of older Town and Paradisa sets. 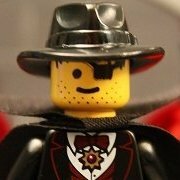 I believe they said there were parts and figures in Series 1 that were currently exclusive to the Minifigures line at the time of launch. I don't think there was ever a guarantee that it was always going to be that way and given that figs have appeared elsewhere since, it's not unexpected. Nice little set. I wish that it came with the grill, parrot, etc. featured on the front, I might pick it up then. But, why pick up a set when you already have all of the minifigs? That's pretty neat. Hopefully we get more like this. Nice find! I wonder if they will be doing this with other CMFs? I like the idea, but $15? That's too much! Thankfully I only have the Hula Girl figure out of this, and I really want the Surfer Dude figure. Thanks. Yes, ever since I saw those calendar figs, I thought that they couldn't have guaranteed that. However, I don't think that we can expect theset to happen much; it would probably make people go less after CMFs if they knew that the figs are going to be re-released for sure later. ..But, why pick up a set when you already have all of the minifigs? I guess a lot of people/kids WON'T have all the figs or complete sets of every series. The series 2 surfer has been pretty rare up til now, so guess this is a good way to get these figs. But can these be really counted as the same 'collectable' figs? 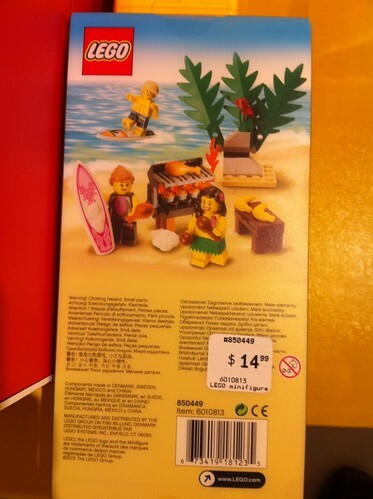 Will people be buying these to complete their sets, or just to add some beach figs to their collections? Well they also give you nice food parts and a bbq etc so 15$ is not bad! Very cool little set, a beach battle pack of sorts. I hope we can look forward to the same concept applied to some of the other CMF themes, especially Castle and Sci-Fi. A sci-fi one would sell really well, I think! This would make a really good add-on for the new creator house. Pretty cute set. A bit too overpriced (especially since you'll rarely see a discount if it's a LEGO shop exclusive) but I like the thought behind it. 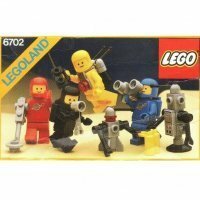 Definitely wouldn't mind seeing a few more of these grouped minifigure sets. I'd also happily accept any sort of Medieval set. Haha, interesting set, but I don't think it appeal to those who have already gotten them. It is a good opportunity to grab it for those who had missed it and I will think the Series 2 Surfer is very much appealing. Like before, I had done my own grouping like this to show the relevance of those minifigures together. Like before, I had done my own grouping like this to show the relevance of those minifigures together. Who knows? 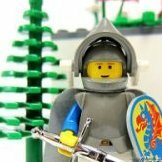 You might have inspired Lego.